It was cloudy and cool all day Saturday, so we spent most of the day working around the trailer. Malcolm finished up his wax job by completing the off-door side of the trailer. The whole outside has now been buffed with a cleaner wax. It looks so new and shiny. 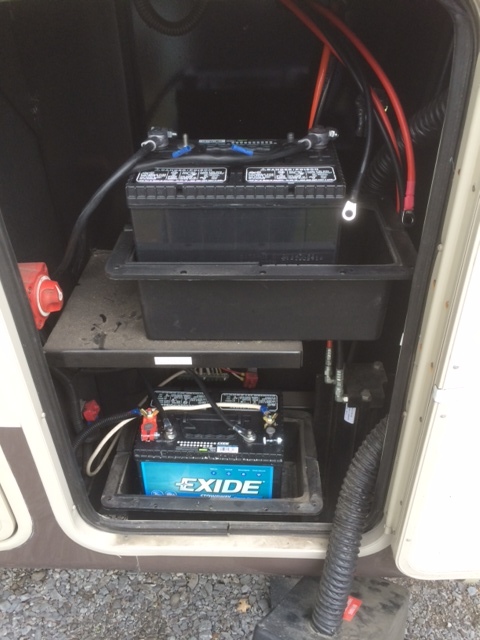 After finishing the wax job, we headed over to Camping World and purchased two new 12V batteries for the trailer. We’re in the early stages of upgrading to a residential refrigerator. We have an inverter and are just now picking up batteries. 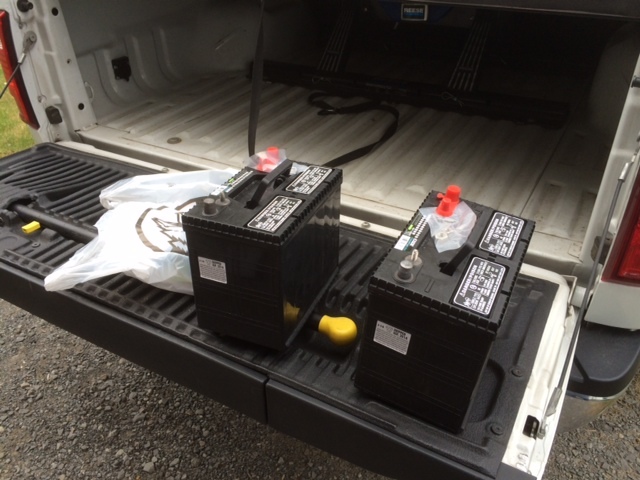 We have two battery boxes, so we planned on having two 12V batteries wired in parallel. Rather than risk pairing up a new battery with our older one, we went ahead and bought a matching pair of new batteries. Malcolm wired up the batteries in parallel using two black cables (they didn’t have a correct red one), then hooked the trailer input cables to the bottom battery. 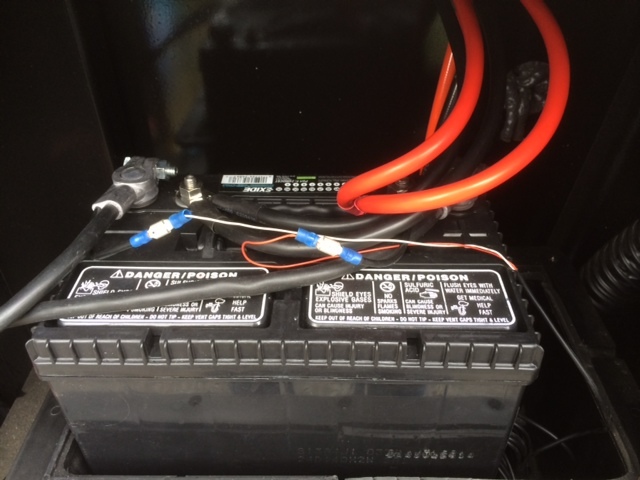 The input leads for the inverter, which is mounted on the other side of the wall in the front compartment, were hooked into the top battery. Finally, the two small connectors were wired up to the tire pressure monitor repeater which sits inside the front of the top battery box. 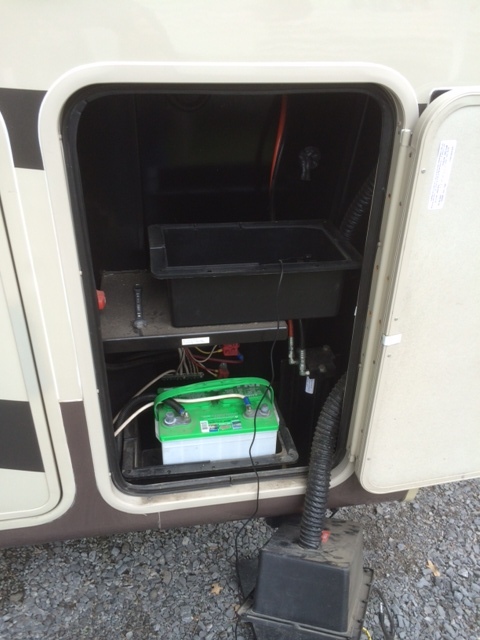 It now serves the dual purpose of keeping the top battery from sliding forward in the battery box (we probably could have gone with the next size battery, but Malcolm bought the same size that was already in the trailer to begin with – a group 24). 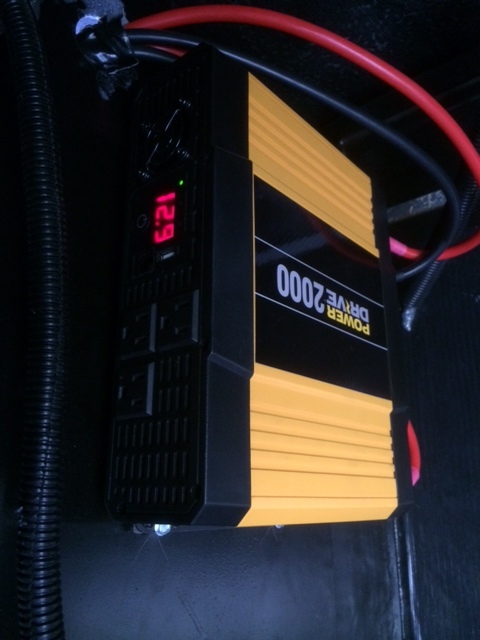 A quick test of the inverter shows it is working and that the batteries had a pretty good charge to begin with. Checking later, the voltage was slowly rising, indicating that the converter was topping off the charge. Malcolm turned the inverter back off after the checks. Nothing for it to power just yet. Also, Malcolm is going to go back and wire the incoming lines to the inverter through a separate 150 or 200 amp fuse. After the battery job was done, Malcolm set about our next task – to remove the built-in grill that came with the trailer. We retained the slide-out platform that it was mounted to and cleaned a huge, messy bunch of grease off of it. We put our Coleman two-burner stove on the platform and will use it for grilling purposes along with a couple of different cast-iron griddle/grill plates that we have, or recently purchased. We found in the past that the Coleman stove will grill burgers, etc. a lot quicker than the built-in grill ever could. 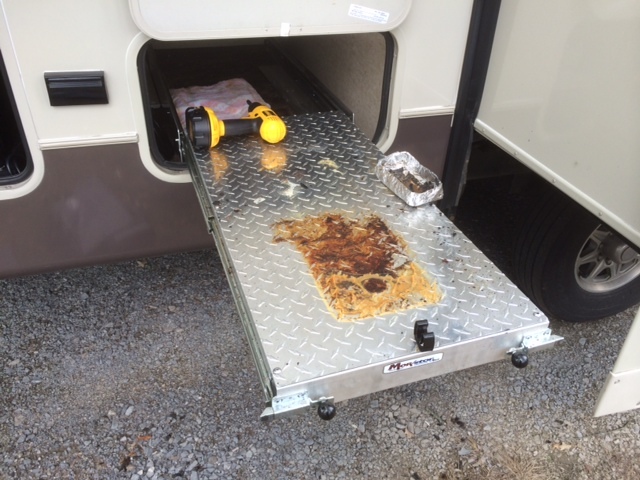 While waxing the off-door side of the trailer, Malcolm noticed that water was dribbling down our hose at the campground spigot. 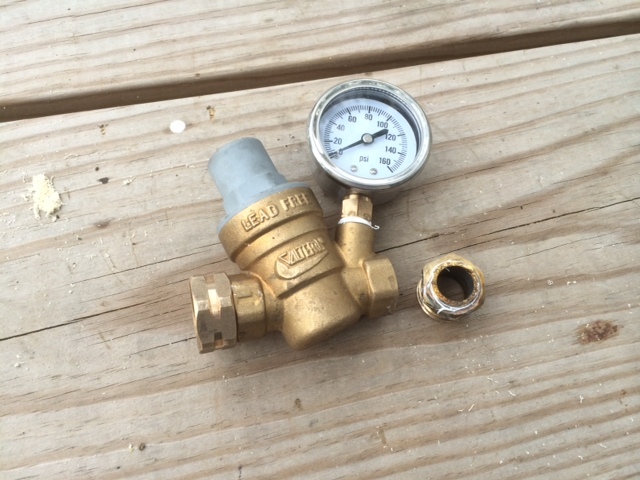 He eventually traced the leak to a joint in the water pressure regular we had just recently purchased here a couple weeks ago. When he tried to tighten it, nothing changed. When he decided to loosen it to see if it needed more Teflon tape, it broke right off. We figure the brass had a crack in it from the beginning. Camping World gladly exchanged it for a new one. 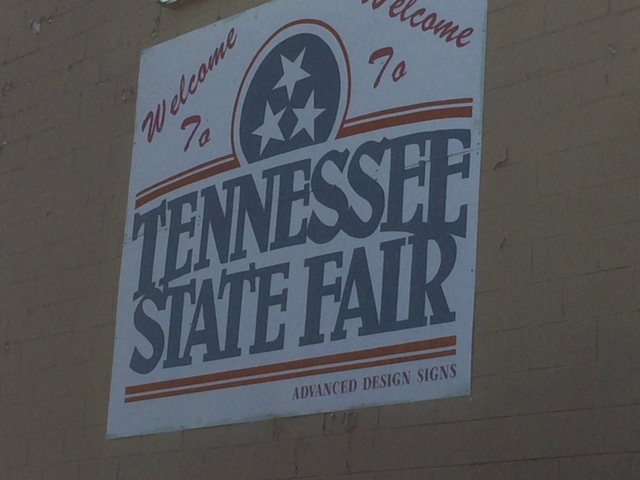 On Sunday, we decided to check out the Tennessee State Fair. 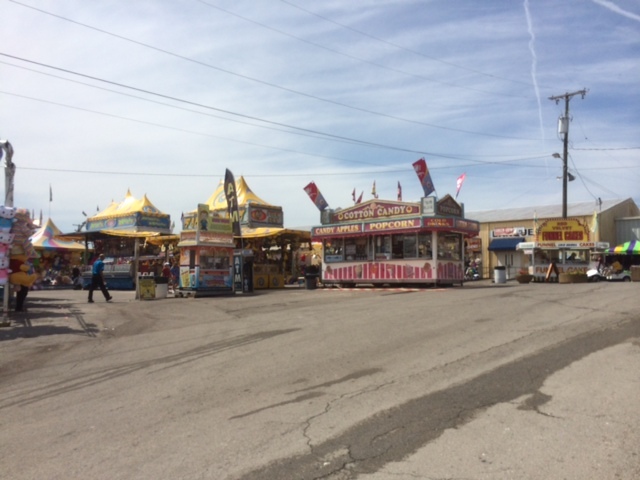 We arrived at the fairgrounds around 11:30 and found out that it opened at noon. We waited in line until noon and paid our way to get in. 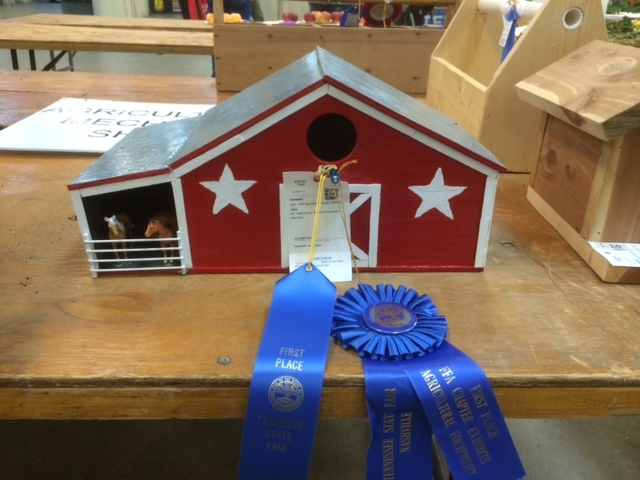 The State Fair here is not as large as we’ve seen in other states, so there wasn’t a whole lot to do. 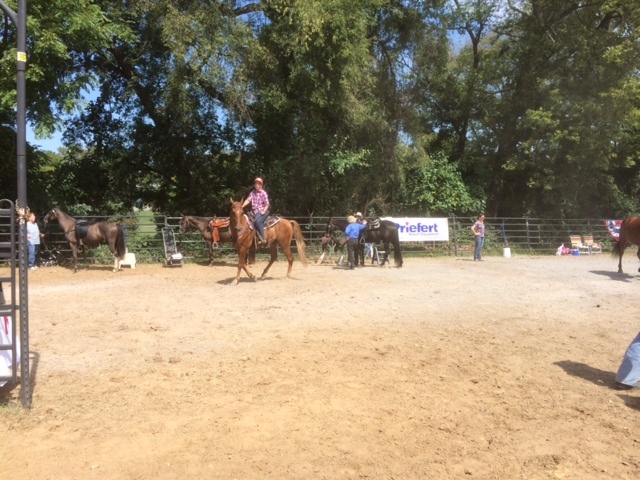 We walked around several exhibits and watched a Tennessee Walking Horse show for a bit. We ended up leaving after an hour and half and ended up at Mellow Mushroom for a late lunch. After lunch, we headed down to the mall and wandered around before heading back to the trailer for the evening. Malcolm washed the truck before dinner since it hadn’t been washed for a couple months, at least. 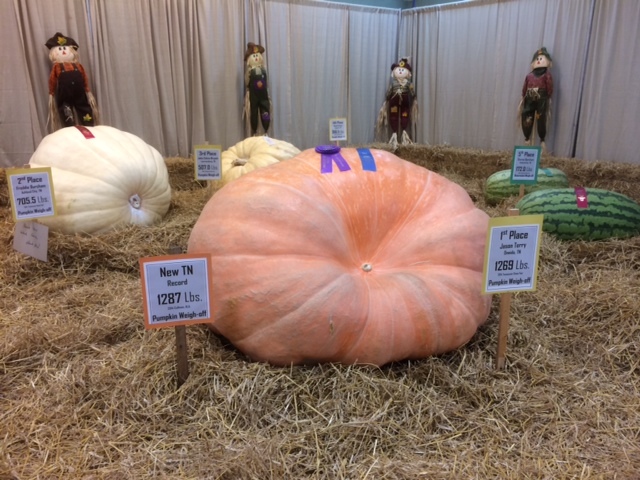 While sitting at dinner, Val was checking her Facebook feed and noticed that Malcolm’s high school buddy, John Boehm, was just down the road at the Opryland Hotel complex for a trade show. Malcolm called him up and told him we were just a couple miles away. Today, John called Malcolm and arranged to meet us for dinner at the Opryland hotel. We met up at 6:00 and found a place to eat inside the hotel. We ended up chatting and catching up until at least 9:30. We’re here this week and next before we travel again. 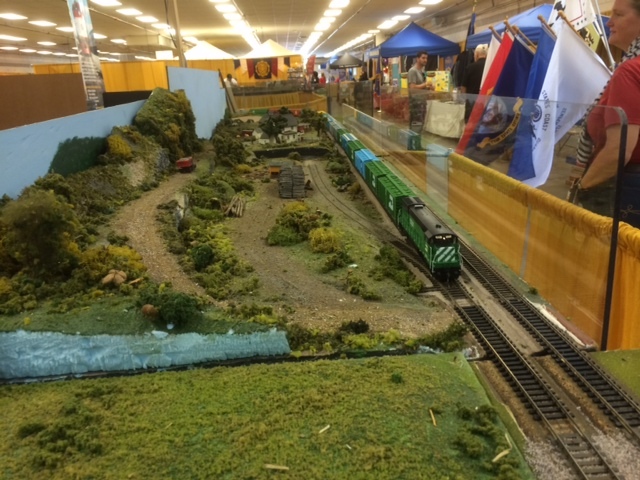 This entry was posted in modifications, Tennessee, Working. Bookmark the permalink.